And of course today more news coverage regarding the parliament elections in Serbia. 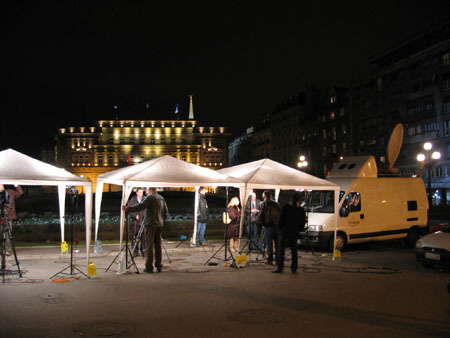 A Dutch reporter was talking in front of the government building in the center of Belgrade. And this is how it looks behind the camera. Being a journalist must be boring, they wait for hours in order to talk for one minute. Parliament elections in Serbia coming Sunday and this evening it was already mentioned on the main Dutch news 'journaal'. They even send a reporter. Because elections are always confusing, both predictions and results I will try to make you more confused with a card trick. If you don't like politics, play card tricks. It is almost the same I guess. Click here for the card trick (open or save). It is just a powerpoint file, virus free. Last weekend the weather was great. On Saturday we did not leave the house because it was already pleasant to work a little bit in our garden. To be honest, I did not do much but Christina and Yde were busy. 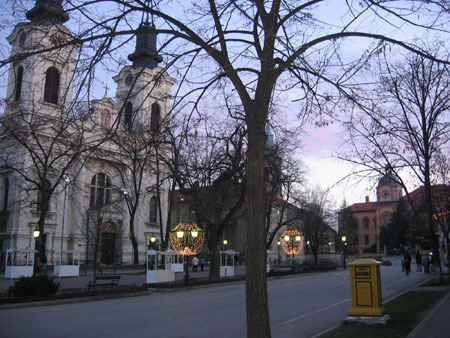 In Belgrade it the same like in the rest of Europe, strange weather in January with no snow at all. On Sunday afternoon we decided to visit some famous monastries in the Fruska Gora region, these monastries are located only 20 kilometers South West of Novi Sad and surrounded by beautiful hills. Because we left in the afternoon we only had enough time to visit two monastries, but that's enough for one trip. 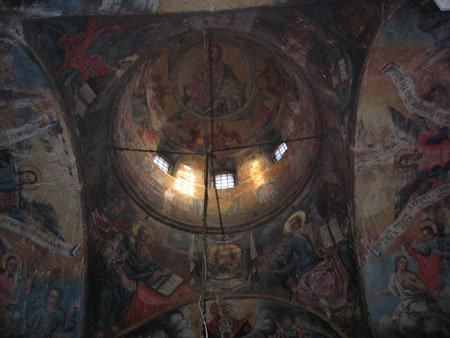 The chapels of the monastries are decorated with great fresco's. You can enter those monastries without much restrictions (in summertime, no shorts etc.). They sell candles and other religious items but at one monastry they also sold monastry wine. I did not bring my wallet but next time I want to try it, it might be good wine, you never know. On our way back we stopped at a small city called Sremski Karlovci. It has some very nice buildings in the center and apparantly a touris organisation. Sremski Karlovci is located close to the Donau. According to that same tourist website they produce world famous wines. I have to admit I never heard of Karlovacki Rizling before I found a bottle in a small shop over there and information on this website. Jitze came home yesterday and gave me a magazine, BelGuest. He said: "Nice articles, you should read it". Busy with other things I did not pick it up immediately so he opened it for me and showed me the article about the Christmas Bazaar. At the top they placed 6 pictures made at the bazaar and I'm on one of it. Dressing up in a traditional Dutch costume was not a bad idea to promote our goods and our country, The Netherlands.